Constructed between l909 and l9ll, this building was designed by one of Manitoba's foremost architects, J.D. Atchison, who had trained and practised in Chicago. 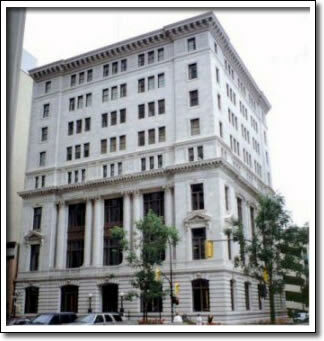 Built as The Great-West Life Assurance Company's first permanent headquarters, its construction materials were principally of Canadian origin. The Neo-Classical facade is of Kootenay marble from British Columbia, a quality material rarely used for Prairie office buildings. Originally raised as a four-storey structure with provisions for an additional ten floors, only four stories were added in l922–23. Incorporated in l89l, Great-West Life was for many years the only Winnipeg-based life insurance company, and was symbolic of Manitoba's growing importance in Canadian affairs. As one of the nation's leading life insurance firms, the Company moved to larger new quarters in l959.